"Look Who's Flying to Dinner"
Superman is captured by a race of red sun powered aliens named the Sunturnians, invading Earth from their base on Neo Sol. Despite their invasion Superman is unusually calm giving them warning that in forty-seven seconds they'll regret their actions. Naturally they ignore this and present Superman to their Allysun, the Solaratrix or Queen of Neo Sol. Allysun is equally as cocky as her subjects, disappointed that the universally famed Superman proved a minimal threat. Superman ends his countdown and Allysun realizes that they underestimated their opponent. Superman reveals that he realized the additional buildings that appeared in the city were actually disguised Sunturnian ships and had then planned a counterattack. Hurling water towers from all across Metropolis into the air above them he timed their reentry for this moment and as the blocks of buildings/ships flood with water Superman uses his arctic breath to freeze the faux city block and hurls it into orbit. While hovering Clark notices the Sunturnian mothership and scans it for any sign of offense. Finding none he then realizes he's more than a little late for Lois' housewarming party. Luckily Clark's date arrives in his place, a stunning brunette named Diana Prince. Jimmy and Jonathan gawp and drool like randy teenagers much to Lois' discomfort. Perry White steps in to rescue Diana till Clark arrives. Over in S.T.A.R. Labs the scientists are tending to Project: Mindstorm or a comatose Hector Hammond. Suddenly Hector's brain activity shuts down sending the scientists into a frenzy to restore order. At that moment Clark arrives back in Metropolis and deactivates his armor. Clark realizes he has had a strained relationship with Lois for a while and tonight will go a long way to moving on, especially as he now has Diana and Lois has Jon. Clark misses talking to his folks when having to consult on such affairs and grabs a bottle of wine as a housewarming gift before his late arrival. Knocking at the door Clark is astounded to be greeted by a dazzling combination of the two women in his life... Lois Lane, absolutely besotted with him and dressed as Wonder Woman too! As she pounces for a passionate kiss... Clark finds himself back at the front door again. Was it some kind of dream? Lois this time dressed in normal clothes greets her best friend with deep affection. In five years this is the most openly affectionate or friendly Lois has ever been. 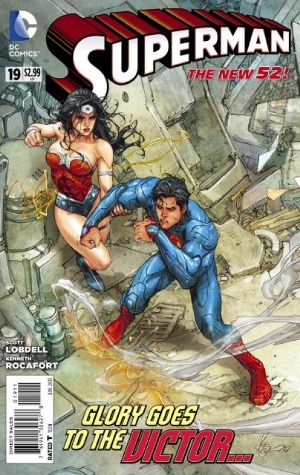 Clark's mind races, especially at the thought that Lois asks for his blessing on her relationship with Jon. Orion arrives on Earth and heads straight for S.T.A.R. bursting in he finds the lifeless body of Hector Hammond and is disappointed to find that the extreme malevolent power he tracked to the lab was not the Superman that Highfather had sent him after. Just in case the visions were wrong Orion prepares to kill Hammond. The S.T.A.R. security services arrive and point out despite the fact Hammond is brain dead they will do all they can to protect the project. Hearing that Hammond's body is without a mind Orion realizes perhaps that Superman himself is the new home for Hammond's mind thus fulfilling the prophecy. Using His Mother Box he instructs it to hunt for Hammond's mind and track Superman's whereabouts. Back at the party Diana compliments Lois on her new place. Lois thanks her but points out that now she is back to being a reporter she isn't sure they can even afford it now. Following from the train of thought of drastic career moves Perry greets Clark as they look at Lois' first Superman headline. Clark admits he might have been a bit overdramatic with his walkout at PGN but is surprised and touched when Perry offers some heartfelt admiration, support and advice to his former star reporter. Before it can sink in Perry whispers in his ear quite venomously that he didn't mean a word of what he just said. Alarm bells ring again in Clark's head at his out of character remark. Clark decides to test his theory out further and approaches Jonathan. As the two men sit down Clark is taken by surprise when Jon thanks him for setting Lois back on the right path from the job she was unhappy in. It only happened because Clark had inspired her with his resignation points out Jon. When a guest attempts to sit his cocktail down on an antique table Jon screams and races to stop them. The macho foreign war correspondent was definitely out of character but nothing compares to what happened next. Lois sidles up to Clark and asks him to make out. Clark points out the disrespect to Jon and Diana but Lois shrugs it off. Clark can't shake the feeling that the weird behavior at the club the night before and the out of character personalities tonight might be connected but Diana steps in and leads him to the balcony. Clark apologizes for being late and expresses gratitude for Diana integrating more into his real personal life. Diana moves in for a kiss but before she connects Clark is literally swept away. Dunked in the river Clark activates his armor and prepares to fight the foe who has discovered his identity. The dunk in the river has cleared his mind and Clark realizes the entire city was psionically manipulated and even his mind was affected as his thoughts were deliberately clouded. As he rises out of the water ready for a fight, a hand grabs his cape, Orion has arrived to ensure the prophecy is never successful. Story - 5: I'm thoroughly enjoying this new direction. Yes, the Sunturnians are more than a bit lame but the mothership offers more for later on so I'll reserve judgement and the fact Clark showed he is intelligent and capable of planning was a nice development. The interaction of Diana Prince with the PGN employees was brilliantly scripted also, showing that they are more than a fleeting romance. Even the scenes where everyone was out of character were fun. 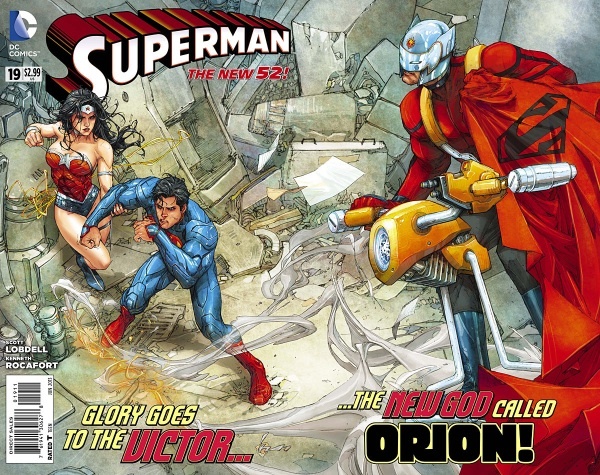 Considering how uneven the Superboy run was until recently Superman has had some great developments and progression. Kudos. Art - 5: The art was just great this issue. I liked that there was just as much effort on the 'civilian' scenes as there were with the superheroic ones. Many comics tend to neglect the drama scenes in favor of the big splashes and double page spreads so it's brilliant to see that it's being given equal treatment. Cover Art - 5: I think this cover is just great, especially when 'unfolded' for the reveal, even though it wasn't as cool as the one in Superboy recently. Since the kiss over in Wonder Woman I've been eagerly awaiting Orion's fight to the finish with Clark. He has Superman's cape for cripes sake! Maybe it's an issue too early and the coloring on Diana's costume is off but I don't care, get these guys to fight already! 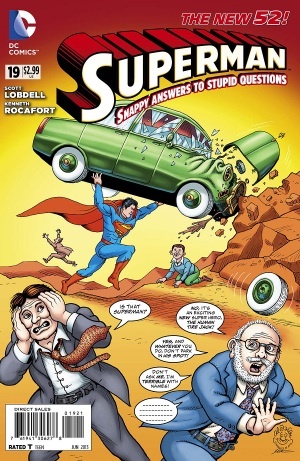 Variant Cover Art - 2: I like MAD magazine, always have but this cover is just... terrible. Personal opinion here, so please if you like it then feel free to tell me. I just dislike every aspect of it. Sorry guys!